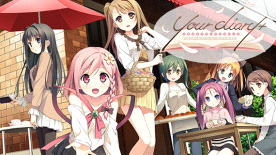 Your Diary is a visual novel game that explores the seven ways people experience happiness in the stories of its seven heroines. What kind of happiness will you pursue? Nagamine Tomosaki is a second-year student at Kazamizaka Academy. Because his parents work abroad, he's been staying at the home of his childhood friend Minagawa Yuuhi ever since he transferred here. He lives a peaceful student life, participating in the library committee and helping out at Yuuhi's family business, the Yuugaotei cafe, after school. Tomoki stops by a used bookstore called Fuurindou, near the shopping district, to look for a book recommended to him by Ayase Sayuki, the chairman of the library committee and an upperclassman he admires. Tomoki isn't surprised to find the interior of the store a match for the deteriorating exterior. The air is humid, the bookshelves are black with dirt, and the many books are covered in dust. Even so, it would be a shame to leave without at least a look around, so he goes hunting for the book he's after. He wanders around the shop for a little while, casting his eyes about until a certain book catches them. On that back of that old book are the words "your diary". A girl pops out, in a wash of warm light. "Are you Yua's new friend?"